My hairdresser gave me a great tip for plumping up my fine hair, after blow drying and straightening spray dry shampoo under the roots of layers and the result is instantaneous. She said it was the same as the salon product they use! It cost less than £2.00! R and Co recently came up with a new formula called Badlands Dry Shampoo Paste. 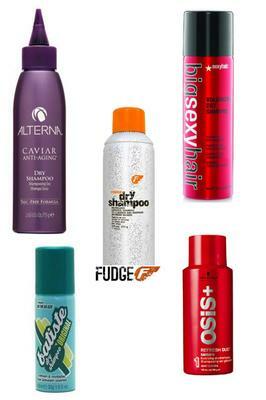 It got all advantages of dry shampoo but also works like paste and texturizing. Perfect for girls with short hair. And those who like to plumping up fine hair as suggested above. Unlike powder or dry shampoo sprays that get all over, you can use it only on area that you want without messing up the rest of your hair... or your shirt! You just take a small amount, rub it between fingers and massage it to your hair. Its a matte finish and smells nice! Like other dry shampoos it also got oil-absorbing ingredients but it made of Volcanic ashes. Volcanic ashes are mostly used in spa treatments as skin purifier http://www.volcanicearth.com/volcanicash.html. Sounds like fun to try! Batiste is not good at all. Bumble & Bumble is great but its not a shampoo. My favourite is Schwarzkopf OSiS. It is light, not noticeable and give very good lift. I tried both Batiste mini dry shampoo and Bumble & Bumble powder. Bumble Powder is much better in holding your style and keep it dry from oil (if your hair feels greasy sometimes). Instead of using spray to hold my style, I use hair powder and it helps when I set my hair up for party. It keeps the pins in place without slipping. Excellent and cost effective solution and it really works. Bumble & Bumble hair powder is another alternative solution to dry shampoo that helps to build volume and temporary hide gray roots. Its tinted and comes in several colors.